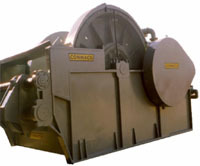 The CONMACO 045 is a double drum waterfall powered by a diesel engine with a power shift transmission. Typical applications are anchor duty and steel erection. 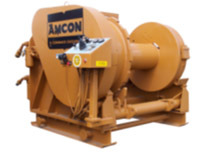 In addition to standard anchor duty, CONMACO can deliver winches for constant tension and abandonment and recovery applications. The JU-36 utilizes a removable power unit offering efficient use of deck space. The diesel driven closed loop hydraulic system provides precise load lowering control. CONMACO can not only supply the equipment to meet your needs, we can also supply a control system tailored to your specifications. 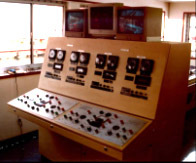 This console is used to control an 8-point mooring system as well as monitor line tension, speed, and footage for each line. This cable spooler can haul a pair of 12 ft. diameter spools of large diameter electric cable to a job site and then use the diesel over hydraulic power unit to install the cable underground. The operator can easily observe the progress while operating the controls positioned at the rear of the trailer. CONMACO designed and fabricated a new crane system for the Corps of Engineers. 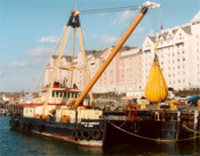 The vessel's lift capacity was upgraded from the original 15 ton to 18 ton main line. A 3 ton whip line was also added. CONMACO delivered a new crane boom, rotating deck, hoists, diesel over hydraulic power unit, and control system with load monitor. The crane was designed for compliance with API 2C regulations. The CONMACO line of Tower Erection Hoists are designed specifically to meet the needs of today's Tower Erection Contractors. Personnel handling; line speed and footage monitoring; and remote operation are just a few examples of the capabilities of this new line of hoists. Using state-of-the-art electronic and hydraulic components these hoists can be custom designed to meet any application, from the tallest towers requiring a large spooling capacity to the basic units used for handling guy lines. 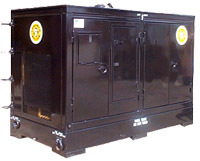 Single, double, or triple drum configurations are available with remote power units that incorporate sound proofing insulation for quieter operation. For maximum versatility, the operator's station can be located at the hoist, remotely, or even in a climate-controlled cab. Joystick controls and digital displays give the operator precise load handling and monitoring capabilities unlike any previously available.